SCVHistory.com | Agencies-Organizations | Newhall-Saugus 20-30 Club, 1947-1956. 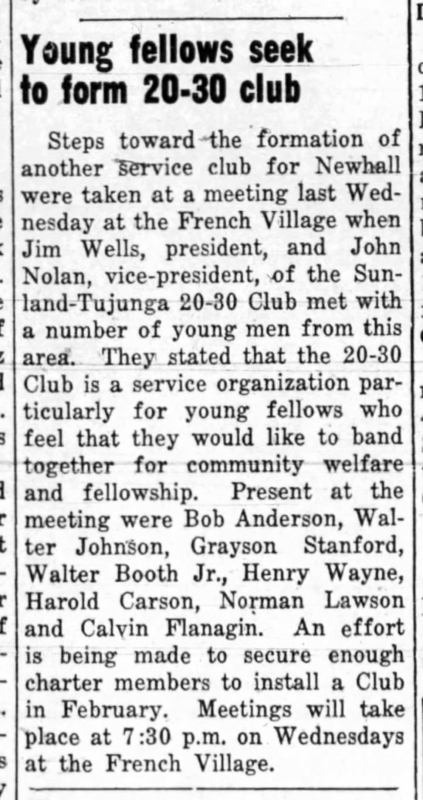 The short-lived service club for young men in the Newhall-Saugus area had to disband when too many of its members were drafted into military service at the time of the Korean War. Their most notable accomplishment as a group was to purchase a live-saving resuscitation device used by doctors and EMTs. The umbrella organzation, now known as Active 20-30 International, is still "active" elsewhere in the United States and Canada today (2017). It is "a service organization made up of men and women in their 20s and 30s who have a passion for improving the lives of children in their communities." A comparable organization in the Santa Clarita Valley today would be the Junior Chamber of Commerce (Jaycees). Young Fellows Seek to Form 20-30 Club. The Newhall Signal and Saugus Enterprise | Thursday, December 11, 1947. Steps toward the formation of another service club for Newhall were taken at a meeting last Wednesday at the French Village when Jim Wells, president, and John Nolan, vice-president, of the Sunland-Tujunga 20-30 Club met with a number of young men from this area. They stated that the 20-30 Club is a service organization particularly for young fellows who feel that they would like to band together for community welfare and fellowship. Present at the meeting were Bob Anderson, Walter Johnson, Grayson Stanford, Walter Booth Jr., Henry Wayne, Harold Carson, Norman Lawson and Calvin Flanagin. An effort is being made to secure enough charter members to install a Club in February. Meetings will take place at 7:30 p.m. on Wednesdays at the French Village. 20-30 Club Will Finance Pulmotor. The Newhall Signal and Saugus Enterprise | Thursday, September 23, 1948. As a means of providing a long needed life saving service for the valley, members of the 20-30 Club, Newhall's service club for young fellows, have undertaken to raise funds to buy a modern resuscitator apparatus and to maintain it free of charge to citizens. The campaign will he launched at a benefit dance to be staged Oct. 22 at the French Village and will be continued until the necessary backing has been obtained. 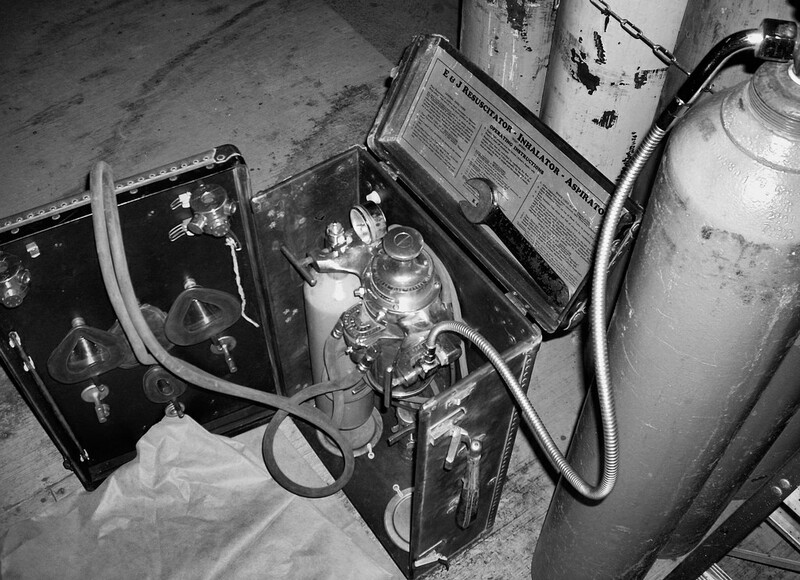 The device was probably an E&J Resuscitator-Inhalator-Aspirator like this one (but not this exact one) by E&J Manufacturing Co. of Glendale, Calif. Click to enlarge. The apparatus itself is of a new type, manufactured in Glendale, which uses pure oxygen, now believed to be the best medium for restoring life and breathing. The outfit has been placed on display in the window of Peggy's Flower Shop. The device is much more than an ordinary pulmotor. It is also capable of being used as an inhalator and aspirator, automatically adapts itself to any size or age of patient, and may be used on two patients at once if necessary. The Hilburn Funeral Chapel has agreed to cooperate with the 20-30 Club by placing its ambulance and telephone facilities at the disposal of resuscitator teams which will be organized and trained. Mr. Hilburn has had a great deal of experience at this type of life saving. In cases of drowning, electric shock, asphyxia or suffocation the prompt use of a resuscitation apparatus enables lives to be saved that otherwise would be lost. The 20-30 Club has undertaken the project of acquiring the apparatus, but welcomes the cooperation of other organizations and the public generally. 20-30 Club Forced to Disband Aug. 1 by Wars and Drafts. The Newhall Signal and Saugus Enterprise | Thursday, July 19, 1956. August 1 will officially mark the end of the Newhall-Saugus 20-30 Club in this valley. News of its dissolution came as a shock and surprise to the community as the 20-30 Club has been one of the (liveliest) organizations in town. The club has done a vast amount of service work in the valley. Several people owe their lives to the resuscitator it bought and provided free of charge. 20-30 members have always been active in the Fourth of July Celebrations. They have sponsored a Boy Scout troop and have done much work among young people. The story behind their dissolution is the story of a long uphill struggle. Before the Korean war the 20-30 Club had over 30 members. After the war started, active membership dropped to six, with some 75 per cent of the total membership in the service. Several times since, the draft board all but exterminated the organization. Now, older members are passing the age limit and joining the senior service clubs. Uncle Sam leaves little material for recruitment at the other end of the age limit, and so time finally ran out for the 20-30 Club.